History was created at UAE when Dubai hosted the inaugural day-night Test in Asia and only the second ever pink ball match. The encounter was made even more memorable as the West Indies played out of their skins and fought valiantly to set up a riveting finish. Skipper Misbah ul Haq won the toss and had no hesitation in making first use of a batting paradise. Opening the innings, Azhar Ali propelled his team towards a massive total with a triple century. Though they put up a fight, West Indies still ended 222 runs short in the first innings. However, the follow-on was not induced as Pakistan chose to push the accelerator in a quest for quick runs. But, the move threatened to back-fire with Devendra Bishoo‘s astounding spell routing them for 123 in the second innings. Despite Darren Bravo’s exceptional century and Jason Holder’s gritty hand, Pakistan held their nerves to pull off a 56-run triumph and go 1-0 up in the 3-match series. Here are some of the most important statistics from the thrilling contest. 1 – Bishoo’s second-innings figures of 8-49 is the best ever by a visiting bowler in Asia after bettering Lance Klusener’s 8/64 against India at Eden Gardens in 1996. 1 – Mohammad Amir managed to pick up more than two wickets in a Test innings, his first since coming back from the ban. 1 – This was the first instance of Bravo registering fifty-plus scores in both innings of a Test match. The classy left-hander followed up his 87 with 116 in the second innings. 1 – Yasir Shah gave away over 100 runs in both innings of a Test match for the first time in his career. He is the ninth Pakistani bowler to do so. 2 – Instances of West Indies batting more than 100 overs in the fourth innings of a Test match in Asia. They had batted 105.1 overs against India at Eden Gardens in 1978. But this time, they bettered their previous best by facing 109 overs. 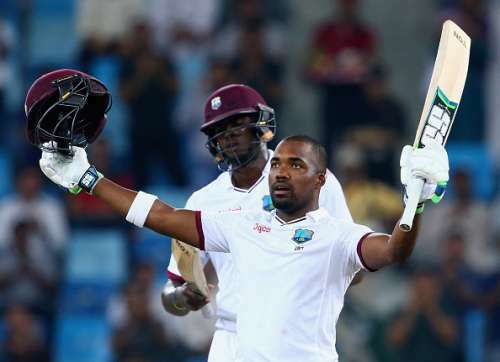 3 – Number of West Indies batsmen to face more than 500 deliveries (combined from both innings) in an away Test. Prior to Bravo’s rearguard, Brian Lara had faced 569 balls at Colombo (SSC) in 2001 and Desmond Haynes faced 531 balls at Dunedin in 1980. 3 – Number of centuries by a West Indies batsman in the fourth innings of an away Test since 2000. Bravo joined Dwayne Smith (against South Africa at Cape Town, 2004) and Shivnarine Chanderpaul (against England at Old Trafford, 2007). 3 – Instances wherein Pakistan have managed century-plus stands for the first three wickets of a Test innings. Before this match, they had managed this feat against West Indies at Bridgetown in 1958 and against England at Manchester in 1992. 3 – Number of non-subcontinental batsmen with more Test centuries in Asia than Bravo’s five tons. Alastair Cook and Jacques Kallis lead the list with eight hundreds apiece and Allan Border has reached three figures six times in the region. Alongside Bravo, Andy Flower and Brian Lara also have five tons in Asia. 4 – Triple centuries by a Pakistani batsman. Azhar Ali with his unbeaten 302 joined the likes of Hanif Mohammad (337 against West Indies, 1958), Inzamam ul Haq (329 against New Zealand, 2002) and Younis Khan (313 against Sri Lanka, 2009). 8 – Test centuries for Bravo, including this one. Interestingly, he has scored seven of those away from home and only one in the Caribbean (against New Zealand at Port of Spain, 2014). 56 – Pakistan’s victory margin which is their lowest at UAE in terms of runs. Their previous lowest was the 71-run win against England at the same venue in 2012. 102 – Wickets for Yasir Shah which is the second most by a bowler after 17 Tests. George Lohmann had picked up 109 scalps from the same number of matches.